I made this very simple 3" square mini card for this week's Waltzingmouse Sketch Challenge #41 and also for a new challenge blog I discovered : the Less is More Clean & Simple Challenge Blog. I am trying hard to do more CAS cards these days, so I am so happy to have found this blog! 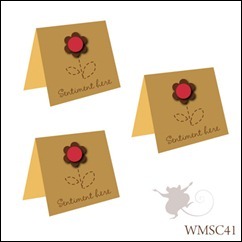 The WMS challenge is to to make "Little bitty mini cards!! They are quick, fun and great additions to a gift, a bouquet of flowers or candy treat." The Less is more challenge is a color challenge - to use a "touch of red". I stamped 5 teeny tiny cupcakes from the Waltzingmouse Frame It set with Memento Tuxedo Black ink on vanilla card stock and colored them with Copics. I and used the clear atyou spica glitter pen to give the icing some sparkle. The cupcakes were cut out with a circle punch and mounted on Cherry Cobbler Heart Circles cut from Nestabilities Doily Heart Circles. The circle in the center is popped up with Dimensionals. The frame and sentiment are also from Frame it. Thanks for coming by - have a wonderful day! These are both really sweet, Steph! How great that you found our blog! Your cards are just super, I just love those touches of red! I hope that you'll be able to join us a regular basis, in our clean and simple challenges. If you could possibly remove the word verification option from your blog that would help us enormously as with over 200 entries each week, it adds considerably to the time we need to spend on commenting! Have a great week and we hope to see you next time! Oooh lovely card, makes me want to eat cake. 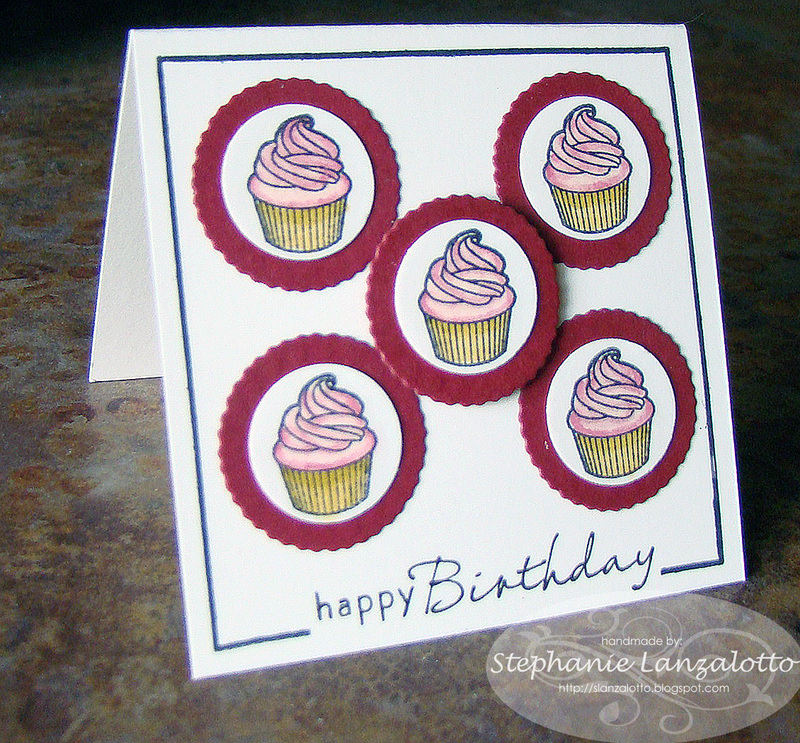 Stephanie, very cute cards you've made this week! Deeee-licous! Love how you featured all of those sweet cupcakes! very sweet! thanks for joining us this week at the Waltzingmouse Sketch Challenge!